Yesh Atid Chairman says government encourages division of 'us and them,' Israelis must speak candidly about the kind of Shabbat they want. Yesh Atid Chairman Yair Lapid on Thursday responded to the Supreme Court's decision to allow Tel Aviv businesses to remain open on Shabbat (the Sabbath). 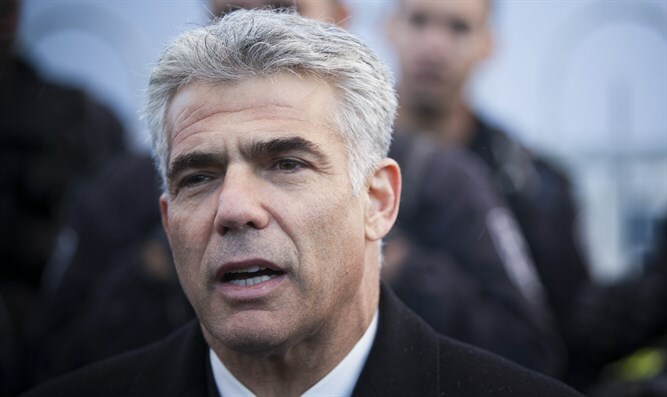 "Tel Aviv is not Bnei Brak," Lapid told Army Radio. "If someone wants to open supermarkets in Bnei Brak on Shabbat, I will demonstrate against it with the haredim. I will say, 'How can you prevent them from living the way they see fit?'" "But in Tel Aviv, people live differently. So how can someone force them to live a different lifestyle? This morning, I visited my friend Rabbi Grossman in Migdal Haemek. We spoke about what happens when you mix religion and politics. This whole story is proof of why the talk about 'us and them' is so dangerous - but the government is encouraging the public to talk about 'us and them.' What we really need to do, before we look for the next fight, is to speak candidly about how we want our Shabbat to be. I want an Israeli Shabbat. "I like the fact that the radio plays different songs on Shabbat. I don't care if you go to the synagogue on Shabbat or if you spend Shabbat with other people, if you have a white tablecloth and kosher food or if you don't. I also want public transportation on Shabbat - but only quiet electric minibuses, and only in secular areas." Lapid also noted that his party had proposed a law to prevent employees from being fired for Shabbat observance.